I'm just not a Halloween person and it feels good to say that out loud. I had my fair share of costume parties in college (thanks to a weekly mixers with my sorority) and I hate feeling scared so scary movies or haunted houses are not my idea of fun. I promise I'm not as much of a drag as those last two sentences made me sound like. If you're somewhat like me and Halloween isn't your jam, the last thing you want to spend your money on is a costume. Check out your closet! I'm sure you can pull together one of the costumes above or take $20 down to Forever21 and call it a day. 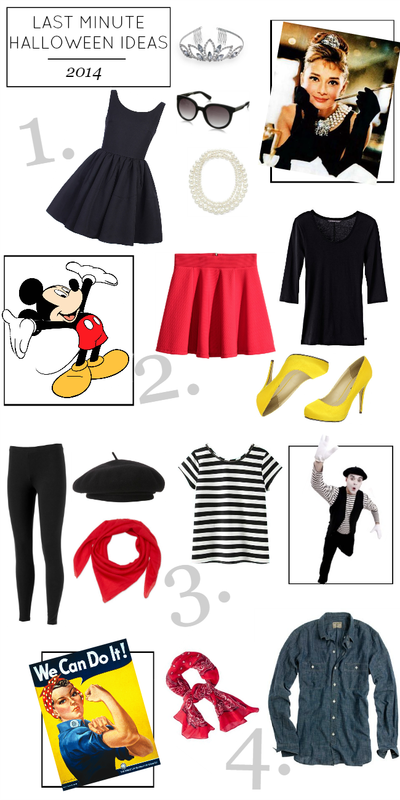 For more in-your-closet Halloween inspiration, check out my post from last year. Holly Golightly is a great go-to costume. That's what I did with a cheap black dress from H&M and some black gloves from Claire's. Everything else I owned!